Invest Openly: What Is Debtzilla (Singapore Board Game)? What Is Debtzilla (Singapore Board Game)? Last year, I have the chance to play the local board game called Wongamania Banana Economy with a couple of financial blogger friends and have fun with it. For my earlier post, you can check it out here. 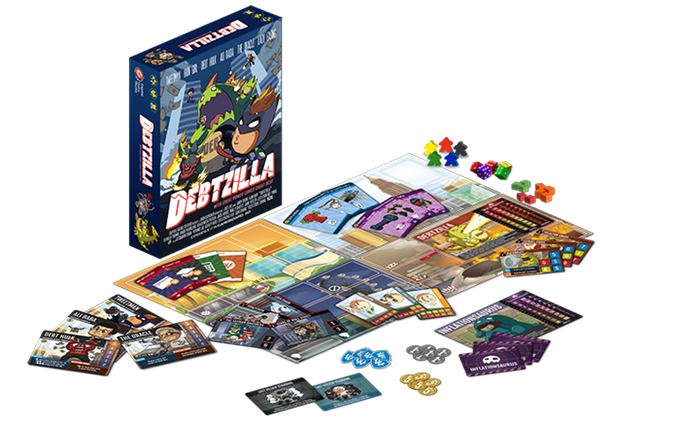 This year, the same game developer, Capital Gains Studio, launched another board game called Debtzilla at Kick Starter. Too bad, I haven't got the chance to play the game yet but basing on the information available in the Kick Starter, the player(s) [up to 4 players] are to assume the role of superheroes (like Lady Easing, The Oracle, Iron Girl etc..) and work as a team to fight against the villains (like The Layman Brothers, Loan Shark, and Corruption Rat etc...), it sound like fun already. Again, the theme of this board game is still focus on financial literacy, I guess the objective is to let players to learn and have fun at the same time. From the number of items included in the box (see below), it seems to cover wider spectrum of the financial world in Banana Republic (as compared to Wongamania). If you are interested to find out more about Debtzilla or to support the KickStarter project, click here.